Aren't Fur Farm Purchases Illegal? 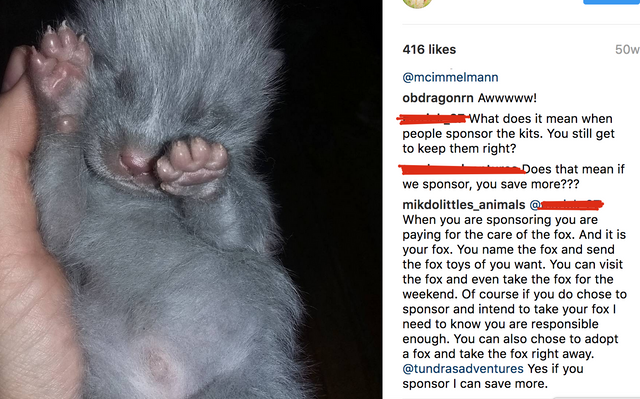 She runs a "fox rescue" for fur farm "rescues" and I'm seeing some major red flags. What do you guys think? I would post pictures here but I don't want her to find this message board. 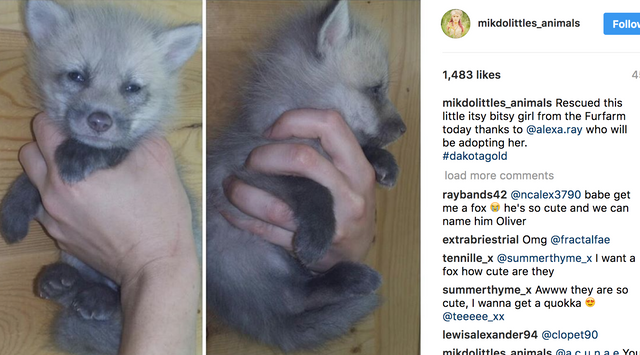 She offers these foxes up for adoption but doesn't check their state/city/county laws before letting foxes go. Am I missing something? Is this a legitimate "rescue"? After visiting a fur farm I saw first hand their living conditions. Small wire cages; most of which are barely big enough for the foxes to turn around in. They live their whole unpleasant lives never being able to put their feet in the cool dirt, play, run, or frolic about as a fox should. Some never even seeing sunlight (they do this so their fur color does not fade). It was devastating to see such beautiful creatures so bored and not getting any kind of love. I knew then what I needed to do. Because of prior years of volunteering, with animal shelters and doing wildlife rehabilitation, I knew what it took to bottle raise the fox pups and how to spot common illnesses like respiratory infections and coccidia. I have a couple exotic vets in my area that work with me to keep my foxes healthy. Most of the pups I get have been rejected by the mother and I need to finish bottle raising them. Some are ill or deformed and would have been left to die or killed inhumanely if I did not step in and rescue them. She lives in Lakeville Minnesota according to the message she got from her city. 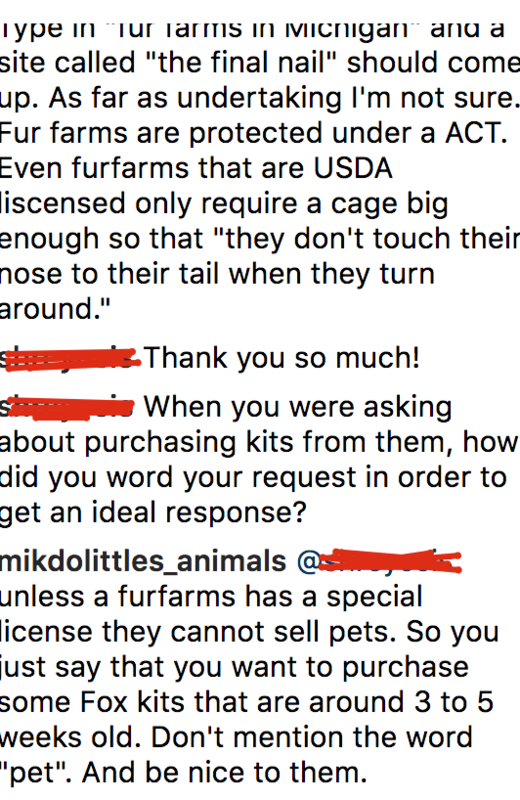 Re: Aren't Fur Farm Purchases Illegal? She claims the farmer gives them to her for free since they are culls(injured, rejected, etc) free would make it legal for the farmer, but that doesn't really add up if she is adopting out kits that are fully healthy and nothing wrong, I mean she'd get some healthy if just rejected but major injuries etc would leave marks and deformities that would not go away and the ones on her site look perfectly fine no missing limbs, ears or other deformities. She also claimed she had USDA when I said she needed that to broker as she is doing but no way to know if that's true, well unless you ask for her USDA number acting like a customer and she gives it to you. Does anyone know someone that got one from her. Could be all an elaborate rouse to get donations. Maybe is legit, I dunno. Does she have photos of these maimed kits on her instagram? I can't do that since it's just for phones. Anyone having got one from her? Maybe this is her first year other than getting her own. The photos of her own all look fully un-maimed though. Oh boy. Found some...interesting information on her (public, might I add) Instagram. And maybe I'm completely off here, but the pictures I found are making this "rescue" look really sketchy. Beyond the fact that I only found two "maimed" kits (one had 3 legs, one had no tail), I found out that she buys the kits from farms sometimes. Proof that she at least used to SELL these kits. And here is her story of how she gets these kits.... Sorry about the size!! And below you see that obviously she knows about wildlife laws. Ugh, this "rescue". I just heard of it today. She does, in fact, sell her kits (https://www.saveafox.org/fox-fur-colors/). For quite a price too, $500-$750! Take one for the weekend? You can't do that with foxes. 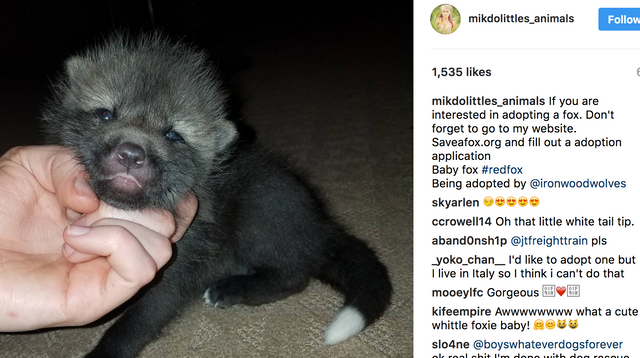 Okay Someone says she's actually shipped some so at least she's legit in that she is actually adopting out foxes as she says. Still weird and we already have too many foxes in the pet trade each year. There were still breeders trying to get rid of last years grown kits just before kit season to make room. And take one for the weekend? Yikes, hope not. I'm not a fan of her "rescue." Especially since I'm wanting to start a real one for unwanted and abandoned foxes. Selling her foxes at that pricetag is a red flag for sure. No real rescue fox should cost $750. They should be given away or sold for a lot cheaper than that. I just don't get it. There are plenty of unwanted foxes and illegal foxes in need of homes that are going to be put down too. Why bring more into the trade unless you want to sell cute kits? Makes no sense to me. If she truly is getting them for free though, AND is USDA licensed, then it's all legal whether or not we think it's ethical for her to label herself a rescue. This all being said, I think she is wanting to do a good thing and feels like she is doing something right. So she has good intentions. Her admitting that was somewhere it the midst of the screen shots. I guess I wouldn't have as much of a problem if she got them for free, but she's admitted to illegal activity! I hope she has good intentions and isn't scamming people ): It seems like most of them were adopted out to people who follow her Instagram. This is probably crazy, but from the pictures on her website of the color morphs in those cages like farm foxes....what if SHE was the one running a fur farm? 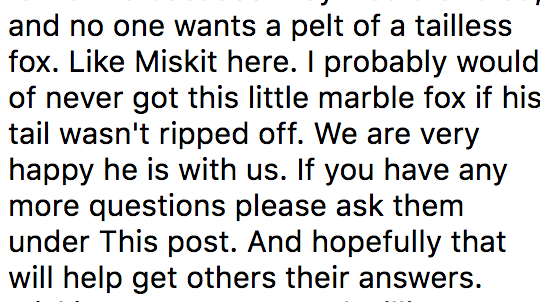 This might sound bad, but I hope at least the buying/selling aspect of her business ('cause let's face it: She buys "wholesale" from fur farms, posts cute pics, gets hundreds. This is not a rescue) gets shut down before more foxes get sent to un-vetted homes. She looks to take great care of her personal foxes, so I hope they get to stay with her, but the whole other rescue part seems super sketch. If the homes aren't well vetted then her rescues will need rehomed and rescued themselves later. She said she sends them on contract but if she isn't sure of buyers legality or their knowledge of foxes to ensure they know what they are getting into and prepared then it could still be a problem. Looks like a good amount of her followers don't have pet fox knowledge. And her basic fox info doesn't do much to help the unaware prepare. 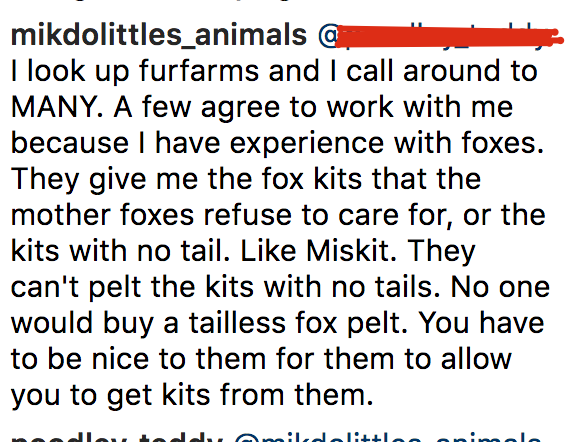 She claims the fur farms can't sell pelts without tails (or people just don't want them), could they not just discount the pelts because of the lack of tail? I'm sure they would still sell. I'd think so may depend on who they are selling to and if part of a certain market and such. My uncle used to have a kiwi farm and if the fruit wasn't perfect they couldn't sell it so a ton was just wasted. Though to make money some do still sell it at farmers markets and then you get the double and weird shaped kiwi that are perfectly edible, cheaper but not good enough to be sold in grocery stores and restaurants. So I could see it being similar for furs if part of a certain group they may get higher prices but can only sell "perfect" furs. Or maybe missing a tail makes it low value enough they don't want to waste resources raising them. But yeah the rest of the fur would still be usable for trim or coats so could potentially still be sold for less. Wow, she has the nerve to call selling a fox for $1500, which she took from a fur farm, a rescue? Yeah, pretty obvious she's doing this with good intentions... But mostly for cash. This isn't an "adoption fee", it's straight up reselling/flipping the animal. Nobody in their right mind would buy from her.